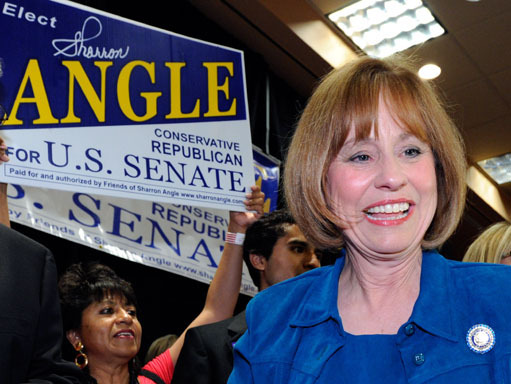 In a meeting with Hispanic high school students on Friday, Nevada Republican Senate candidate Sharron Angle downplayed her campaign's use of generic pictures of Latinos to present a negative image of illegal immigrants. Angle has run a series of ads slamming her opponent, Senate Majority Leader Harry Reid, for being soft on illegal immigration. Questioned about the ads, which feature somber-looking, dark-skinned men and phrases like "illegal aliens," Angle told a Hispanic group from Rancho High School that the ads do not necessarily portray Latinos. Furthermore, she told the students confronting her that they themselves do not necessarily look Latino. In the meeting, first reported on by the Associated Press, a student asked Angle, "Why is it that in all of your commercials you have the image of Latinos? What do you see when you hear, and I quote, 'illegal aliens?'" Angle responds: "I think that you're misinterpreting those commercials. I'm not sure that those are Latinos in that commercial. What it is, is a fence and there are people coming across that fence. What we know is that our northern border is where the terrorists came through. That's the most porous border that we have. We cannot allow terrorists; we cannot allow anyone to come across our border if we don't know why they're coming. So we have to secure all of our borders and that's what that was about, is border security. Not just our southern border, but our coastal border and our northern border." A video of the exchange is available from the Las Vegas Sun. In the video, students can be heard snickering at Angle's response. The Sun released additional video footage today, which shows Angle further addressing the issue of ethnicity. "So that's what we want is a secure and sovereign nation and, you know, I don't know that all of you are Latino," Angle told the Hispanic group. "Some of you look a little more Asian to me. I don't know that. What we know, what we know about ourselves is that we are a melting pot in this country. My grandchildren are evidence of that. I'm evidence of that. I've been called the first Asian legislator in our Nevada State Assembly." Rancho High School teacher Isaac Barron told the AP his students organized the meeting with Angle because they felt her ads stereotype young Hispanics. He said her response was met with incredulity. In the heated Nevada Senate race, illegal immigration has become a hot topic, and Angle's ads have suggested Reid has helped illegal immigrants at the expense of Nevada residents. One such ad used a picture copyrighted by Getty Images, with three men described by Getty as Mexicans posing in Mexico, the Washington Post reported. In Angle's ad, the words "illegal aliens" appeared over the image. Hispanics account for roughly 25 percent of Nevada's population, and as Angle has taken a hard line on immigration issues, Reid has sought to strengthen his support within the community. He recently put the Dream Act, an immigration reform measure aimed at helping young students and military enrollees, up for a vote in the Senate as part of another bill, but the measure failed. The Senator created some controversy over the summer when he said, "I don't know how anyone of Hispanic heritage could be a Republican."